Designer Liner is clay based and heavily pigmented. Use this versatile product to create fine detail with lines, dots, and letters. The metal writer tip allows for ultimate control to draw ultra-fine or bold lines, typography and intricate illustrations. Designer Liner is best when used under non-moving transparent or semi-transparent glazes. Fires cone 06 - cone 6. Certified AP Non-toxic and Food Safe. Available in a variety of essential colors. 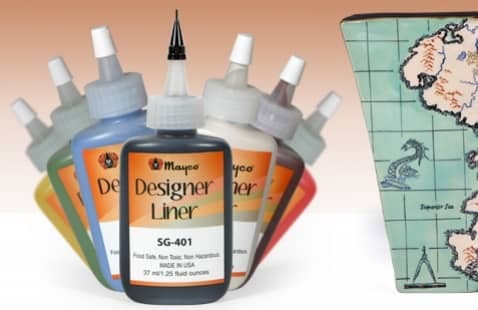 Designer Liner is a concentrated pigment that can be used to create designs, outlines, stripes, dots, lines, words and squiggles. It can be applied directly on clay, bisque, or over other glazes. Designer Liner will fire matte without a clear or transparent glaze to cover. Designer Liner in its fired state will result in clean and crisp lines. Without a clear or transparent glaze over, Designer Liner may not be suitable for dinnerware due to surface characteristics. The following application recommendations are based upon the original product development intent and use for the product. Information on alternative application methods is listed in the section "Usage Variations and FAQ's". To achieve the cracked pattern (pictured above: Apply Cobblestones over any non-toxic glaze. While Cobblestones can be applied over a previously fired glaze the cracked pattern will become more pronounced if applied on an unfired glaze. Shake for 5-6 seconds before use. Dispense glaze onto a palette (tile, plate, etc.) and apply 2 coats with a broad, soft brush, such as a CB-604 #4 Soft Fan Brush. Apply the second coat while the first coat is still damp: do not allow Cobblestone to dry between coats. Pattern break-up is determined by the application direction of the brush stroke. Large break up heavier application, small breakup lighter application. If application is too light the cobblestone will not break up. Reapplying and touching up will not achieve a break up. Fire to shelf cone 06 or higher.